Saturday 4 July saw Kasabian cram the inmates of the West Ryder Pauper Lunatic Asylum onto a shiny tourbus and release them upon 6000 souls in a disused Cornish clay pit. 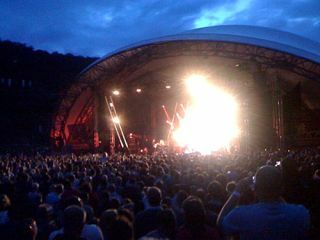 The clay pit in question is of course the Eden Project, home to the world's largest greenhouse and host to an annual programme of summer concerts branded as the Eden Sessions. Given that the closest thing to a Biome that most people have visited is likely to be a B&Q garden centre, for the uninitiated, the Eden Sessions promise a new kind of gig experience. After dealing with a little light fascism from the security team, Team MusicRadar arrives, greeted by an environment that for all its engagement with nature can't help feeling oddly synthetic. Kasabian frontman Tom Meighan will later compare it to Tracy Island, in truth, it feels more like Tracy Island colliding with the Theme Park videogame. Before the night's entertainment begins in earnest, a couple of overpriced pasties - when in Cornwall, etc - seem to be the best food option. Perched on a wall in the cafeteria area, the pre-gig atmosphere is curiously sanitised and the nearby strains of expletive-peppered hip-hop feel nearly as inappropriate as they might piping through the aforementioned branch of B&Q. At 8:00pm it's showtime, and a flaccid display from support act The Hours probably isn't helped by about half of their potential audience being trapped in two huge, snaking bar queues. However, by a quarter past nine it's time for Kasabian to take to the stage and the main amphitheatre area is fit to burst with a crowd laden with as many drinks as they can carry. Kasabian kick off their set with new LP opener Underdog then launch into Shoot The Runner and the mood begins to warm up nicely. This is a fine place to watch a band - the live area's elevated sides mean that regardless of stature, everyone has a great view, and there's an intimacy to proceedings you rarely find at an outdoor event. "Fire creates the biggest bang of all the newies, getting a huge reception from the crowd." Despite the evils of the bar queues, some bright souls decide that launching two-thirds full plastic - right on? - pint glasses indiscriminately into the crowd is a good idea. Toto, I've a feeling we're not in B&Q anymore. It kind of feels like a rock festival now. Indeed, Kasabian really take off during the second half of their set and recent single Fire creates the biggest bang of all the newies, sitting comfortably alongside staples like Club Foot and Empire and getting a huge reception from the crowd. It's not quite the all-cylinders performance of Glastonbury 2007, but the band end the night in fine style. Meighan conducts the obligatory crowd sing-along of LSF, the strains of which continue long after Kasabian have left the stage. The next day, we visit the Eden Project to check out the exhibits - wristbands not only grant entry to the Eden Sessions shows, but also the Biomes and other areas throughout the weekend. By morning, Eden looks and feels like a family-friendly tourist attraction once again. We sincerely hope that whoever was in charge of cleaning the vomit out of the neatly-manicured hedgerows was paid handsomely for their nightshift. Click here to book tickets for the remaining Eden Sessions dates featuring Razorlight, The Kooks and Paul Weller.